Our process, The Vision Advocate ExperienceTM, is to create the time and space necessary for a "thinking environment," where we can collaborate with you to forge solutions for your concerns and facilitate the implementation. Whether you are a business owner, physician, or personal client, we will take you through two distinct phases of thinking and planning for your future. You will achieve clarity about what you want. Nothing is more important than this conversation. We work with you to find the unique and promising opportunities that represent your future vision. The Advisor Connection allows your existing advisors to join in taking the time to understand your vision of the future. We bring all of your advisors into the same room where you share your vision. Your Ideal Solution™ The Ideal Solution is the most cost-effective, long-term strategy for taking your existing resources, putting them into action, and moving you towards your stated vision of the future. 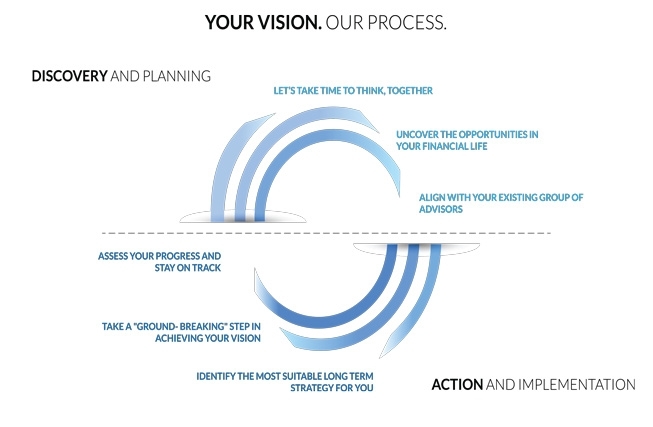 Your First Move™ Your first move is the "ground-breaking" step in your strategic plan. Review & Beyond™ Once your plan is set in motion, we stay involved via updates and review conversations.